Family owned portrait of a late relative of the house Serebry; an uncle Karl Serebry, portrayed victorious over his foes. When not in his armor, Gregor dresses in the manner of a particular freeholder style shown here; A loose woolen overcoat hangs lightly over the more intricate lined coat beneath, both made from fine wool and dyed black and gold. Aside from that, the outfit consists of a simple linen shirt and pair of loose breeches, the latter tucked into a sturdy pair of boots, finally complemented with a loose woolen cap. The outfit as whole, makes a fine traveling outfit, suited for the winters of the freeholder lands or the heat of the summer country with easy adjustment. Masterwork Guisarme +7 2d4+7 Slashing 20 ×3 Reach 10 ft. Skill Focus (Diplomacy): Because a marshal has a way with people, he gains this feat as a bonus feat. If the marshal already has the feat, he can choose a different one. Auras (Ex): The marshal exerts an effect on allies in his vicinity. He can learn to produce different effects, or auras, over the course of his career. The marshal may project one minor aura and (starting at 2nd level) one major aura at a time. Projecting an aura is a swift action. The aura remains in effect until the marshal uses a free action to dismiss it or activates another aura of the same kind (major or minor). A marshal can have an aura active continually; thus, an aura can be in effect at the start of a combat encounter even before the marshal takes his first turn. Activating an aura involves haranguing, ordering, directing, encouraging, cajoling, or calming allies. A marshal sizes up the enemy, allies, and the terrain, then gives allies the direction that they can use to do their best. Unless otherwise noted, a marshal's aura affects all allies within 60 feet (including himself) who can hear the marshal. An ally must have an Intelligence score of 3 or higher and be able to understand the marshal's language to gain the bonus. A marshal's aura is dismissed if he is dazed, unconscious, stunned, paralyzed, or otherwise unable to be heard or understood by his allies. A marshal begins play knowing one minor aura of his choice. As his marshal level increases, he gains access to new auras, as indicated below. All bonuses granted by a marshal's auras are circumstance bonuses that do not stack with each other. Minor Aura: A minor aura lets allies add the marshal's Charisma bonus (if any) to certain rolls. Motivate Dexterity: Bonus on Dexterity checks, Dexterity-based skill checks, and initiative checks. Master of Tactics: Bonus on damage rolls when flanking. Major Aura: Beginning at 2nd level, a marshal can project a major aura in addition to his minor aura. A major aura lets allies add +1 to certain rolls. This bonus improves by +1 at 7th, 14th, and 20th level. Motivate Attack: Bonus on melee attack rolls. Masterwork Full Plate +8 +1 -5 35% 20ft 50 lb. Buckler +1 - -1 5% - 10 lb. Hands Mark of the Initiated (Right Hand) Once per day, the person with the Mark may add +2 to any skill or save roll, after the roll has been made. Until a full 24 hrs has passed, that person cannot use the Mark again under any circumstances. Character History: Amongst those few who hoped to stand up to Baron Aleskander Surr, Count Zoltan Serebry was of the first to answer the call to arms, hurriedly marshaling his small but disciplined retinue, he marched at the side of his fellow freeholders in campaign. 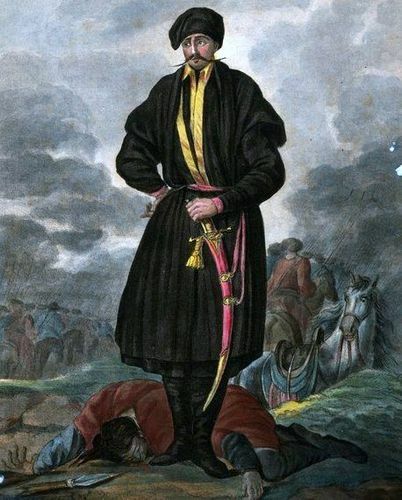 Despite Count Zoltan's remarkable martial skill however, his relatively smaller contribution and being a lesser though independent noble made him something of spectator in the war-room, Count Serebry's greatest contribution remained on the battlefield, where his performed valiantly against the forces of Surr, particularly against monstrous mercenaries of the Baron. Sadly, the tide was quick to turn for the freeholders, the tragic and final collapse came so swift and so sudden that no complete nor credible account of the campaign has survived; all opposing leaders, Count Serebry included, are believed to have either been fortunate enough to perish on the field or else in the aftermath of Surr's dungeons. Even those few commanders who did survive were too scattered in the ensuing chaos, fleeing for their very lives from Surr's armies and agents. In the end, the full truth lies scattered with those who'd sooner forget, worn by the passage of time or hidden underneath the odd legend or rumor surrounding Surr's greatest victory and, of course, with the domineering warlord himself. Count Serebry is survived by his wife and his young son, a sudden insight by the Countess allowed them to make a timely escape from the Serebry ancestral estate, young Gregor would remember that night as the last time he would ever see his childhood home ever again as Surrian orcish forces soon descended upon the County of Serebry, laying waste to everything in its path, delighting in the sweet vengeance wrought upon the lands of the man who cost them many of their kin. Young Gregor, his mother the Countess, and a handful of their retinue made a harrowing flight through the longest night of their lives, narrowly avoiding Surr's agents and managing to make their way to Sardas, where they obtained passage to Avalon. Throughout their trek, they were forced to spend much of their earthly possessions, paid for passage, discretion, food and shelter, finally all making the final sea passage to Avalon as little more than refugees with the garments on their backs. Lady Serebry's half-brother -a minor but noted court retainer- took the family in. The remaining retinue went on along their way, ever thankful to the Countess for their deliverance from Surrian retribution, they remained in loose but friendly terms. But It was still an uncertain time for the family; hope lingered that Count Zoltan would be able to escape to Avalon and news was sought regularly at the docks and inns, but most refugees fled either to Killian and Athe, so news from their homeland was scant, brought only by a few known merchants and travelers who sailed to the Autumn lands. Finally, the arrival of not Count Zoltan, but that of a haggard and crippled Sir Emeric, Count Zoltan's second in command, who brought them the grim news of the demise of the freeholder alliance versus Sur. Coping with their losses was hard, harder still was getting accustomed to their new lives in Avalon, though their noble rank had not exactly been enthusiastically received in Avalon, Countess Serebry's credentials, combined with her social graces, were worthy enough for a retainer position at the same noble court of her relative. Young Gregor had to adjust as well to their new home, the huge and bustling city of Avalon is a glaring contrast to the vast tracts of plains and farmlands of his former homeland, the people around him were definitely more urban and less concerned with crops, rainfall, or even the harvest ball. Yet Gregor soon adapted to the ways of the Avalon, he formed a lasting friendship with his cousins, from there and as he matured into young adulthood, Gregor began to learn and maneuver the social circles of Avalon, making many friendly acquaintances among the high and low alike and it seemed that Gregor would follow in the footsteps of becoming a court retainer, not a bad life but this was not enough for the Freeholder Scion. Instead, he entered into tutorship under a restored Sir Emeric, who found a position as a martial instructor. Under Sir Emeric, Gregor's training was split between combat practice with regular recruits and the study of strategy and tactics, he learned how inspire and boost the charisma of even the gruffest guardsman. Eventually, Gregor was soon a prime candidate for a tactical command position amongst the rank and file of a noble retinue. But again, this was not enough for Gregor, whose sights were set on nothing less but the restoration of the fortunes of the Serebry family, be it in the Freeholds or elsewhere and for such an ambitious goal, only one venue offered enough rewards to achieve this; adventuring, thus Gregor concluded his training with Sir Emeric and departed to seek fortune and glory.